Further to the listing process business is ongoing and successful. Last week the company participated in the IAAPA/EAS trade show in Amsterdam and received many new leads to work on and quote. New prospective installations in Helsinki (Finland), Oman, Germany and Qatar are being planned. Following the success of our DC Rivals Hyperloop installation we are now moving one of our other installations to a new ride, Superman, where we expect the same results as has been generated on DC Rivals. Our test-installation at Europa Park is going well. For the first time in history we are running our new 4.0 software which means we can sell videos online directly to guests. The full launch of the Ridercam HD 4.0 system is now moving closer day-by-day. The company is currently testing the new camera solution and performing various other integration tests. Also in development is our new corporate webpage which has undergone a total re-design and content upgrade. We hope to be able to launch our new page later next week. 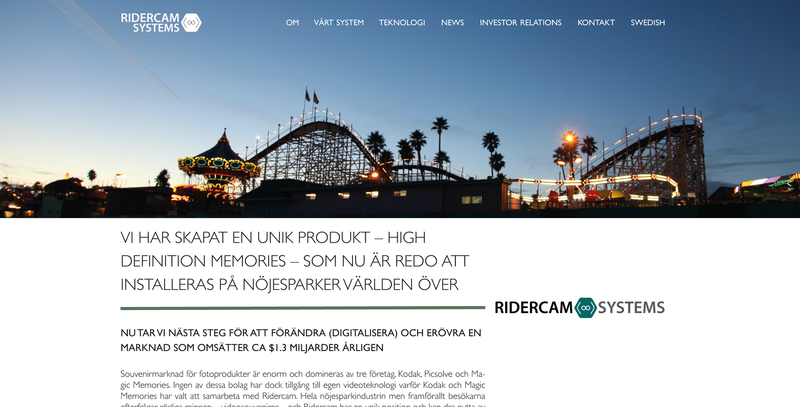 (The headline above reads: We have created a unique product - High Definition Memories - ready to be installed in FunParks all over the world). Stay tuned and have a great weekend!